One of the biggest pprof advantages is that it has low overhead and can be used in a production environment on a live traffic without any noticeable performance penalties. But before digging deeper into pprof, we need a real example which can show how to identify and fix performance issues in Go. The service needs to collect some basic metrics - the number of incoming requests and how long every request takes. All collected metrics are supposed to be sent to a metric aggregator (e.g. StatsD). In addition, the service needs to log the request details - URL, IP address and user-agent. You can find the initial implementation on GitHub tagged as v1. ab -k -c 8 -n 100000 "http://127.0.0.1:8080/v1/leftpad/?str=test&len=50&chr=*"
The benchmarking was performed on MacBook Pro Late 2013 (2.6 GHz Intel Core i5, 8 GB 1600 MHz DDR3, macOS 10.12.3) using Go 1.8. The CPU profiler runs for 30 seconds by default. It uses sampling to determine which functions spend most of the CPU time. 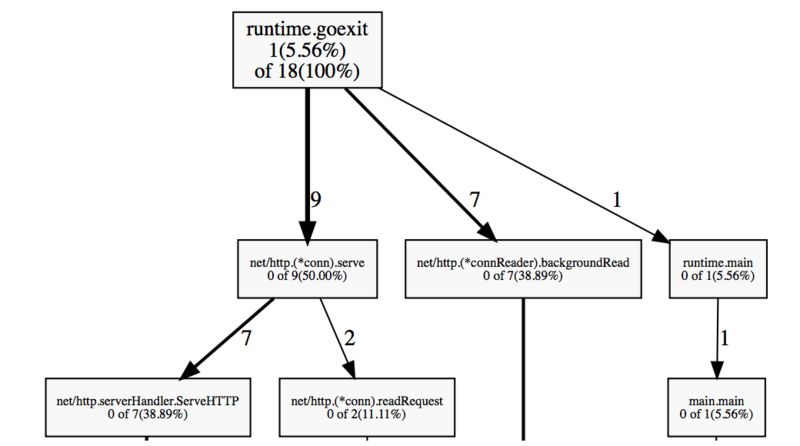 The Go runtime stops the execution every 10 milliseconds and records the current call stack of all running goroutines. 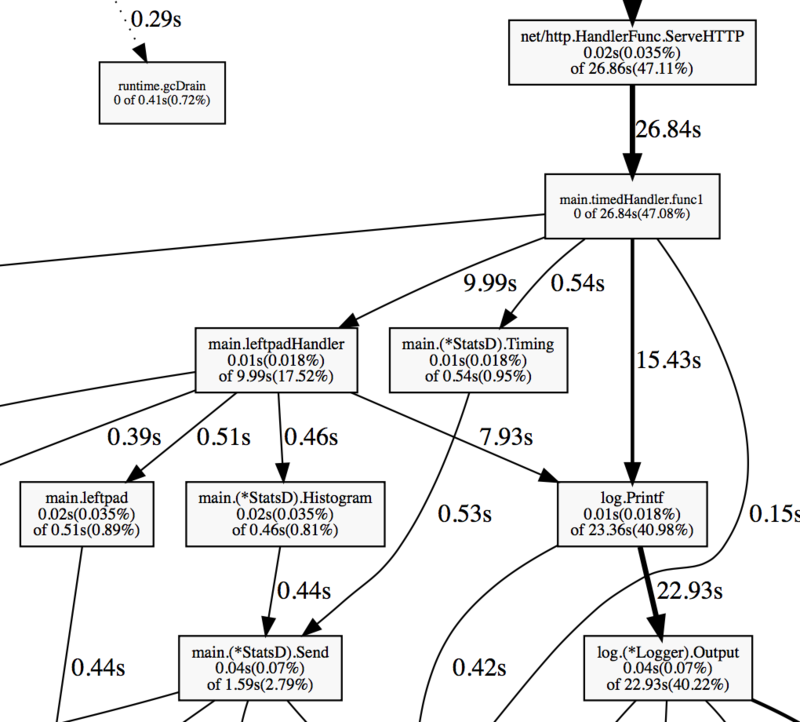 From the graph above you can see that the application spends a big chunk of CPU on logging, metric reporting and some time on garbage collection. Other useful options to debug memory issues are -inuse_objects - displays the count of objects in-use and -alloc_space - shows how much memory has been allocated since the program start. Automatic memory management is convenient, but nothing is free in the world. Dynamic allocations are not only significantly slower than stack allocations but also affect the performance indirectly. Every piece of memory you allocate on the heap adds more work to the GC and makes it use more CPU resources. The only way to make the application spend less time on garbage collection is to reduce allocations. Whenever you use the & operator to get a pointer to a variable or allocate a new value using make or new it doesn't necessary mean that it's allocated on the heap. Go Escape Analysis Flaws paper by Dmitry Vyukov describes more cases that escape analysis is unable to handle. Generally speaking, you should prefer values over pointers for small structures that you don't need to change. For big structures, it might be cheaper to pass a pointer than to copy the whole structure and pass it by value. There are only 18 active goroutines, which is very low. It's not uncommon to have thousands of running goroutines without significant performance degradation. Blocking profile shows function calls that led to blocking on synchronization primitives like mutexes and channels. Before running the block contention profile, you have to set a profiling rate using runtime.SetBlockProfileRate. You can add the call to your main or init function. 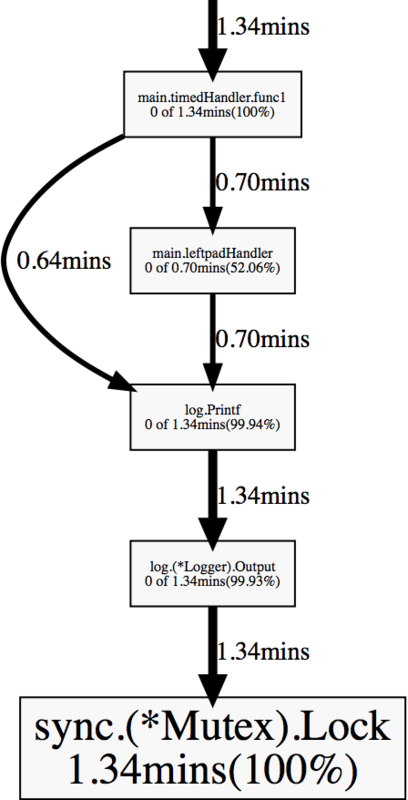 timedHandler and leftpadHandler spend a lot of time waiting on a mutex inside log.Printf. It happens because log package implementation uses a mutex to synchronize access to a file shared across multiple goroutines. A good but not always obvious way to make the application faster is to make it do less work. Other than for debug purposes the line log.Printf("%s request took %v", name, elapsed) doesn't need to be in the web service. All unnecessary logs should be removed or disabled from the code before deploying it to production. This problem can be solved using a leveled logger - there are plenty of logging libraries. Sprintf is convenient for string formatting, and it's perfectly fine unless you start calling it thousands of times per second. It spends CPU time to parse the input format string, and it allocates a new string on every call. We can replace it with bytes.Buffer + Buffer.WriteString/Buffer.WriteByte. The function doesn't need to create a new Replacer instance every time, it can be declared as a global variable or as a part of StatsD structure. Replace strconv.FormatFloat with strconv.AppendFloat and pass it a buffer allocated on stack to prevent additional heap allocations. I used benchcmp to compare the results. The web service can handle about 10000 additional requests per second now! Prefer values over pointers for not big structures. Preallocate maps and slices if you know the size beforehand. Don't log if you don't have to. Use buffered I/O if you do many sequential reads or writes. If your application extensively uses JSON, consider utilizing parser/serializer generators (I personally prefer easyjson). Every operation matters in a hot path. Sometimes the bottleneck may be not what you are expecting - profiling is the best and sometimes the only way to understand the real performance of your application. You can find the full source code on GitHub. The initial version is tagged as v1 and the optimized version is tagged as v2. Here is the link to compare these two versions.